Microsoft’s corporate mission is to help businesses and people around the world realize their full potential. On Monday, we released the 2013 Citizenship Report, which describes our citizenship work in support of our company’s mission during the last fiscal year and shares our vision for what’s to come. Together with our annual financial report, which was also released Monday, it provides a full accounting of our fiscal and citizenship priorities and performance. · Fiscal year 2013 was a significant one for Microsoft Citizenship, as we focused our philanthropic work on providing education, employment and entrepreneurship opportunities to youth around the world. Our goal is to reach 300 million youth, over three years, through the Microsoft YouthSpark initiative. In our first year, the initiative created opportunities for more than 103 million youth to imagine and build a better future for themselves and their communities. · Microsoft donates an average $2 million a day in software donations to nonprofits around the world, making it easier for them to do more good in their communities. Through our Technology for Good program, we developed a pilot to help nonprofits implement Microsoft Office 365, our cloud-based software solution. September 2013 marked the official worldwide launch of Office 365 for Nonprofits, making the suite of communications and productivity tools available as a donation to nonprofits. Office 365 for Nonprofits is now available in 41 countries and will be available in a total of 90 countries by July 2014. · We marked the 30th year of our employee giving campaign. Our employees donated more than $100 million to more than 18,000 nonprofits worldwide in fiscal year 2013, helping us reach an exciting milestone: $1 billion in employee contributions and Microsoft matching gifts to more than 31,000 nonprofits since 1983. · In 2012, we committed to achieving carbon neutrality by the end of our 2013 fiscal year. We met this goal with the introduction of an internal carbon fee based on current market pricing for renewable energy and carbon offsets. Since the carbon fee was implemented, we increased our purchase of green energy in the U.S. by 70 percent: 1.1 billion kilowatt hours (kWh) in 2011 to 1.9 billion kWh in 2012. · In an effort to help us further integrate human rights into our culture and throughout our operations, we launched the Microsoft Technology and Human Rights Center. Among other duties, the Center will develop an annual program of events and engagements to advance understanding of the human rights impact of information and communications technology. 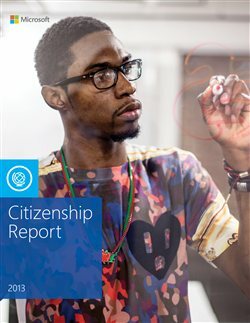 The Corporate Citizenship initiatives and results described in this report are a reflection of the work our employees do, day-in and day-out, to create technology that improves peoples’ lives and to operate our business in ways that meet the highest standards of corporate social responsibility. We recognize that there is always more that we can do, and we welcome ongoing feedback from our many stakeholders around the world. Please let us know your thoughts…we look forward to hearing from you.